The lion dance is a Chinese tradition that stretches back over 1000 years and represents good luck and prosperity. It is performed at Lunar New Year and special occasions as a blessing and cleansing of an area to bring health, wealth and longevity – the three attributes of a good life. Traditionally, lion dance and feng shui go hand in hand, with rules and guidelines to follow to positively affect the energy of an environment and those in it. 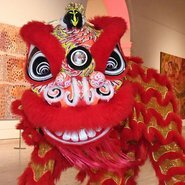 Witness the spectacle of this traditional performance at the Gallery as the Choy Lee Fut Chinese kung fu school usher in the new Year of the Pig.